Skanda: Supreme Deity or Divine Rascal? "Kandar Anubhutiyil Pothinthu Meypporul Tattvam"
Note: It is my humble duty to acknowledge that I have prepared this paper on the basis of information I gathered from several of Sannittiyan's devotees and also from scholarly works of several distinguished and learned writers and publications which I have listed out in the references at the foot of this paper. As I do not wish to err in my presentation on the historical aspects of this tirusthalam I have in fact adopted what Mr. S. Arumugam has said in his often quoted book on Ancient Hindu Temples of Sri Lanka. Selvasanniti Murukan Temple is situated in Thondaimannaru in the Vadamaradchy division in the district of Jaffina in the North-Eastern province of Illankai (which is the Tamil name for Sri Lanka). 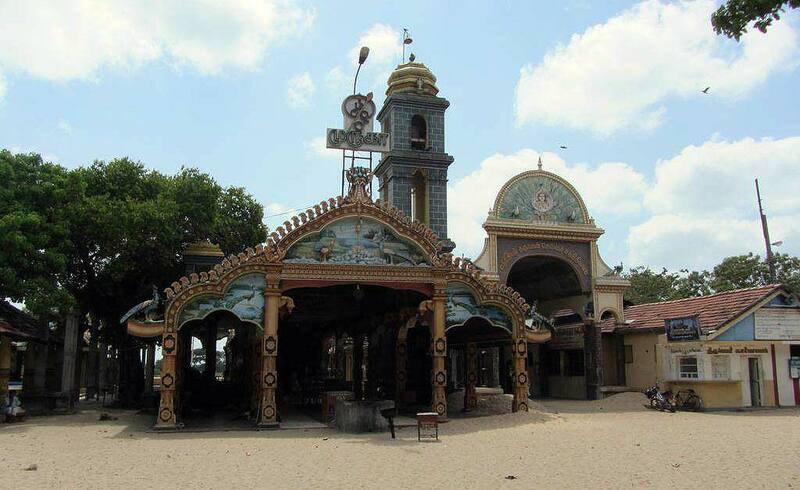 In view of its location the circle of devotees of Sannittiyan is largely from the villages in the Vadamardchy and from other places, closer to Thondaimannaru - like Achchuvely. When presenting this paper with humility, the writer takes pleasure to be identified as one of such devotees hailing from Karanavai - one of the villages in Vadamaradchy. Selvasannithy is revered as Sella Katirkāmam of the North. This temple of Śrī Murugan at Thondaimannaru is about 20 miles north of Jaffna Town. Here too, as at Kathirkamam, a free atmosphere for worship pervades. Persons of various walks of life congregate here for tarisanam of the youthful Muruga Vel, installed at this blessed Sannittanam (Selva Sannitti). The origin of this sthalam, which is not so very ancient, is known history. The waters of Thondaimannaru (teertham where fresh water outflows into the sea) flowing past the site, elevates the location to a sthalam blessed with the triple adjuncts of tīrtham, sthalam and mūrti. This is a water way that is said to have been excavated under the supervision of Karunagaran Thondaiman. He was sent here for procurement of salt supplies by Kulathunga Cholan, who reigned in Chola Nadu. The temple by the side of the newly cut waterway was the place of worship of the settlement that will founded in the locality. The temple however suffered the fate of devastation like all other Hindu temples, in the hands of the forgiveness in the 16th century, Later, during the era of revival of Hinduism in Jaffna, a temple was erected at the site, but differences among the management hindered its proper function. At this stage, the story shifts to one Kadirgamar, a keen devotee of Murugan, who proceeded to Katirkāmam, and was rewarded there with the gift of a silver Vel, the emblem of Murugan. He brought this sacred Vel and installed it in a madam at the site and performed daily pujas to it. Later, he was permitted to use the temple itself, which he took over and he and his group have been managing and officiating ever since, to the satisfaction of all devotees. Today, the Selva Sannithy Murukan shrine is a well established institution, with a temple and several madams in the locality. Daily hundreds of devotees and mendicants throng the place. The historical Thondaimannaru lagoon enhances the sthalam with tīrtham facilities and there is always food available in some matam or other in the locality for the mendicants. Several devotees come here and distribute annadānam, fulfilling their vows for favours received from high. It has become a place noted for this, so much so, that the deity Himself is known as Annadāna Murukan. The temple conducts regular pujas and annual festivals. There is of course less ritual in the puja and other ceremonies, than are seen at temples officiated by Brahmin priests. The worship at Selvasannitti is unique. It is the piety, with which the devotees worship which acquire for them His Almighty Murukann's Grace, takes precedence over rituals and traditions. The devotees surrender to Murukan and their thoughts and acts are merged with Him. Even temple priests perform - puja as "first among the worshippers" as often pointed out by Professor K. Sivathamby. The priest covers his mouth with a cloth and does poja. This tradition is said to have commenced with pojas being done without chanting mantram. In Jaffna, which is a land where Saiva Agama traditions have been followed particularly the religious renaissance introduced Ārumuga Navalar, the worship at Sannitti devoid of Agama tradition has found a significant reputation largely because of the faith reposed in Lord Murukann by His devotees. This high level of devotion has acquired a significant recognition for the form of worship adopted at this temple. This illustrates that even in temple worship it is the devotion that matters and not the form and ceremonies. The Divinity is 'potential full ' but it is inconceivable and inexpressible. "Becoming is said to manifest in three stages. First stage is the kāma or the desire or the ichcha to become. Second is the jñāna or the wisdom to become. And finally it is the action or kriya of becoming. Thus ichcha, jñāna, and kriya or will, wisdom and action respectively are the three subsequent manifestations of the primordial throb of the one state of transcendental reality. "Valli is Ichcha Sakti and Teyvayānai is Kriya Sakti. Since Katirgamar was born from the third eye or the eye of wisdom of Shiva, Katirgamar stands for divine knowledge and wisdom (jñāna). Just before any manifestation, in its purest state, 'Being-Becoming' or Katirgamar state has no form, no name, no attribute, no qualities nor functions. This is the subtle inconceivable state of the "Being-Becoming" which is worshipped in Katirgamar as the Supreme Transcendental Absolute (formless form). "This accounts for the shrine at Katirgamam having no image nor idol whatsoever or even a symbol since divinity transcends all these. What is explained by such a temple is that Divinity is inconceivable and inexpressible. In other words it is apparently 'nil' but potentially 'full'." Thus we see that the unique form of worship at Sannitti is not only significant but has been accepted, and is acceptable, as recognised form of worship in our religion. Basic attributes of a temple as recognised in Hinduism are mūrti (deity) sthalam (sacred shrine) and tīrtham (holy water). One of the great statesmen and philosophers of our country Sir Ponnampalam Arunachalam in his writings on the worship of Murukann vividly pictures the devotees meditating on Him in silence adoring Him as the Supreme God, Subramaniyam -- the all pervading spirit of the Universe, the Essence from which all things are evolved, by which they are sustained and into which they are involved, - who in gracious pity for humanity takes form sometimes as the youthful God of Wisdom, God also of war when wicked titans (asuras) have to be destroyed, sometimes as the holy child Murukan, the type of perennial youth of tender beauty, always and every where at the service of his devotees. "In the face of fear. His face of comfort shows. In the fierce battle-field, with 'Fear not', His lance shows. Think of Him once, twice He shows, to those who chant Muruka." "A refreshing coolness is in my heart as it thinketh on Thee, peerless Muruka. My mouth quivers praising Thee, lovingly hastening Muruka, and with tears calling on Thee, Giver of gracious help-hand, O warrior! With Tirumurukarruppadai Thou comest, Thy Lady in Thy wake". Although when making these analysis Sir Arunachalam does not specifically refer to Selvasannitti, the same, no doubt, reflect Murukan's divine presence at Selvasannitti. Prasadam (offerings) is presented to Sannittiyan in banyan leaves. Sixty-five leaves are spread for that purpose. The rice offered as such prasadam is taken by the devotees as medicine. Feeding babies with rice for the first time. A number of the devotees of Sannittiyan confirm that by all these forms of worship, which of course they do with faith and devotion, they receive Murukan's Grace for their progress in life. It is said that although arrangements were to be made to construct a Rajakopuram, Lord Murukan ordered not to proceed with the same because he did not want to be covered and wanted to be seen from all four sides. Although a magnificent the (chariot) was constructed from 1981 to 1984 it was later destroyed unfortunately. Is this plight also destined by the wish of Sannittian, who wanted to be with his devotees in a simple way? "Vel" - the lance instrument of chastisement and salvation signify his energy of wisdom (Jñāna Shakti) and Selvasannitti Kovil is one of the temples where Velavan is worshipped by that symbol. 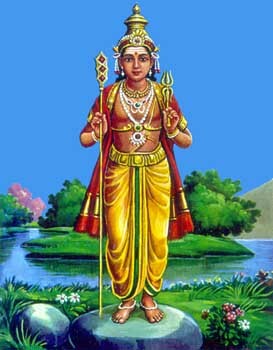 Murukan means tender age and beauty and is often represented as the type of perennial youth, sometimes as a divine child and also as Arumugam. The Puranas and other writings have described the part played by each face and each of his twelve arms and show that this form was a personification of various divine aspects and powers. "Muruka would thus appear to be a deity in whom were amalgamated many legends and traditions, many aspects of religion and modes of worship, primitive and advanced, and to embody the Hindu ideal of God immanent in all things and manifesting himself wherever sought with love." There are two other Murukan temples in Sri Lanka which do not follow the Agama traditions. One is in the South - Katirkāmam (Kataragama) and the other in the East - Mandūr Kandaswami Kovil in Batticaloa district. The mūlasthāna mūrti in the sanctum of Mandūr Kandaswami Kovil in Batticoloa is not opened for view and pujas are performed behind a curtain. We have already seen in the paragraph on historical aspects, the Vel worshipped here was brought from Katirkāmam. On the flag hoisting day (the first day) of the annual festival of Katirkāmam, it has been the custom to have ceremonies at Selvasannitti sending Murukan to Katirkāmam and receiving him after the tīrtham (last day of the Katirkāmam annual festival). Another unique link with Katirkāmam is mavilakku made of tinai flour, mixed with honey. Murukan thus small lamp boats are made and lighted. After lights are burnt it is taken as prasadam by the devotees. If a big lamp is made, twleve wicks are put, representing twelve hands of Murukan. His Almighty lives in us and this Kovil upholds that highest noble precept of our religion in that Murukan lives in the heart and mind of every devotee of this Temple. That is perhaps the reason he has chosen to live in a simple construction at Sannitti. People of all ages and levels - rich and poor - surrender to Murukan at this Temple. Religious experience at Sannitti is an extraordinary one. Prof. K. Sivathamby, who has rich experience of having lectured at both universities in the North Eastern Province, has in all his articles on Sannittiyan pointed out a vital aspect of the devotees circle of this Kovil. He points out that one truth should be stressed that these devotees are not a westernised crowd. Divine power in the form of Murukan conquers every one here. Selvasannitti, which is synonymous with annadānam, has several madams where devotees are fed. Hinduism considers giving annadānam also a puja and is called Maheswara pūja. This is another special aspect of this kovil which can be described in modern terminology as the people's temple. This temple with a number of madams has been a home for sannyāsis. 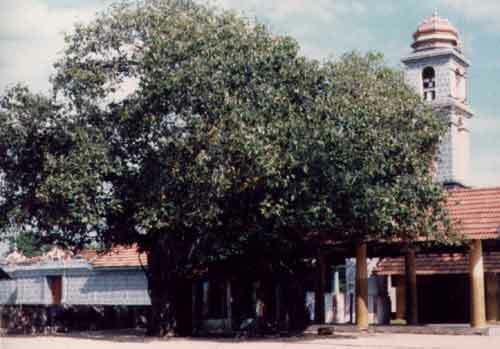 In Jaffna Sannitti has been the main accommodation and meditating vernue for sannyāsis. Speaking to the devotees of Sannittiyan, one cannot resist the conclusion that He is worshipped here largely as the God of Wisdom by those who seek spiritual enlightmant, and as the giver of all boons, worldly and spiritual, to his devotees. Temples had been the focal centre for the religious, social, cultural and educational activities of the people as pointed by researches of ancient records (kalvettus). Temples provided a place to connect with others--a physical version of conference calling. The kovils encompassed within their precincts madams for feeding, musical and dance performances, schools, libraries facilities for scholarly research and medical centres. Kings had raja mandapams built in the temples. Thus in the ancient times kovils were the centre point not only for worship but also for upilftment and service to humanity. The people reaped those benefits of the faith in a divine atmosphere. In the same way in a spiritual atmosphere Selva Sannitti heals physical and mental wounds of Murukan's devotees. They seek His blessings to cure their illnesses. They also seek Murukan's grace for betterment in their life. Weddings take place in Valliamman Shrine there, again devoid of the customary rituals but with the blessed tali. 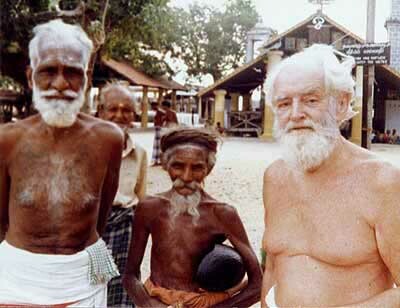 Several of people's experiences at Selvasannitti of Murukan's grace are written and spoken of. A number of books (including songs and articles) and several of devotees have narrated these spiritual experiences which are no doubt manifestations of Murukan's presence at this Divine place. have I been born, and I am weary, O Lord." "Whatsoever the eye seeth is Thou. Whatsoever the hand doeth is Thy worship. What the mouth uttereth is Thy praise. The earth and other elements and all living things are Thy gracious forms, O Lord". Several poets have sung the greatness of Selva Sannittiyan. Of course His greatness can continue to be sung for ever. The recorded songs include. Articles on Selvasannitti by Prof. K. Sivathamby. Aattankarayan by Prof. and Mrs. Shanmugathas. Collection of Murukan Padalkal (in 12 volumes) published by Colombo Gintupitiya Arulmigu Sivasubramania Kovil. Kandiah Neelakandan, Attorney-at-Law, Partner of the Law Firm of Murugesu & Neelakandan, Colombo., is General Secretary of the All Ceylon Hindu Congress (Federation of Hindu Religious Associations and Trusts in Sri Lanka. He is also Secretary of the Hindu Educational Society and Office-bearer of several other religious & cultural associations.